Good morning everyone. You’ll notice in the slider above is the renderings of the Marathon and Half Marathon medals for this year. They will be shiny and bright like last year!! Our medals depict The SLO Life. And here in SLO County, we have beautiful beaches and the great Pacific ocean on our doorstep. You’ll see the stand-up paddler and a whales tail in the shadow of Morro Rock. 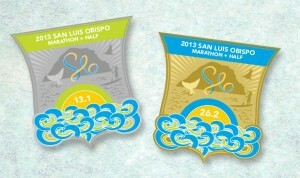 We had some incredible whale sitings and tales here recently in Avila Beach, so we wanted to put them in our medal. SLO County is a great outdoor playground. Please share this with your friends and come register for our event!